Home Riding Horse The Alternatives to a Dirt Floor in Horse Stalls? The Alternatives to a Dirt Floor in Horse Stalls? Choosing the right flooring in your horse’s stall is very important to his health and overall fitness, especially the fitness of his legs and feet. He’s going to spend a lot of down time in there and it’s only fair to him, as well as to you as his owner, to provide a floor that will not only be comfortable and allow for good traction when he needs to move around or lie down but also have no serious long term disadvantages. You need a material that will allow for proper drainage of fluids, both the water and other liquids that run into the stall, as well as his urine. The good news is that there are plenty of options to choose from. Most of these can be easily separated into two categories: porous materials and non-porous materials. Porous materials are any materials such as sand, wood, or clay which allow water to seep through them. Porous materials are usually softer than non-porous materials and afford excellent drainage. Any moisture left on the floor of your horse’s stall will simply soak right into the ground and disappear. A disadvantage to porous materials is that due to the fact that they are not solid materials, they require a lot of maintenance. 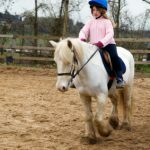 You may have to continually sweep and rearrange your flooring to ensure a comfortable and evenly spread floor for your horse. Dirt, sand, or clay, although being supportive and comfortable for the horse’s legs, requires a lot of maintenance to keep even and odor free. If left to itself for too long, a floor made of dirt, sand, or clay can end up smelling terrible and causing leg strain or even injury to your horse. Plastic grid flooring, while providing a comfortable, porous floor surface, also stays level, stable, and lasts for a very long time. If you choose to use plastic grid flooring, make sure to lay it over an under-surface that has good drainage to ensure proper flow and exit of moisture. You may choose to fill the holes in your plastic grid with either grit made from crushed stone or just plain dirt. Wood is no longer very common in most modern horse stalls due to its tendency to be among the most expensive flooring materials. It is, however, a very comfortable material for your horse’s legs unless the wood surface becomes uneven and warps which may happen with time or excessive moisture. If you choose to go with wood for the floor of your horse’s stall, make sure to provide plenty of bedding for your beast. If there is no bedding for him to lie on he may get scraped or end up with unpleasant splinters in his hide. Wood floors also need constant odor control to keep them from smelling too bad. Non-porous materials are materials such as stone, brick, or concrete which do not allow for passage of water through them. Although they can tend to be quite hard, non-porous materials are easier to maintain and last for a very long time. If the floor of your horse’s stall is built with non-porous materials you will have to make sure it slopes gently into a good drainage system or place gutters in either sides of the stall to allow moisture to escape. Concrete, asphalt, brick, and stone, although being extremely easy to clean and take care of, may cause your horse to slip when their surface becomes wet. Bedding is a necessity as these hard surfaces can be quite uncomfortable for your horse to rest on. Rubber matting is a porous material that is easy on your horse’s legs. It will also prevent him from digging into the ground. It will give him extra traction for moving around or lying down and can be more soothing on his joints and limbs. Rubber matting is a very durable material that provides excellent drainage and doesn’t tend to hold odors. A disadvantage to rubber matting is the initial investment you must put into it but after that it will pretty much hold its own and provide maximum comfort and health for your horse while also costing a minimum in maintenance and repair.